When I was a small child, my parents rented a summer cottage on Cape Cod Bay. I awoke the first morning at dawn, excited about a day at the beach. As I peered out the window that faced the bay, I was astonished and crushed to find that the glittering sea from the evening before was now all sand, as far as my eye could see. Based on my limited experience with contained water, all I could think was that a very powerful someone had pulled the plug and let it all drain away. It was a tragic thought back then, but sometimes I wish I could recapture that simple naive way of experiencing life. 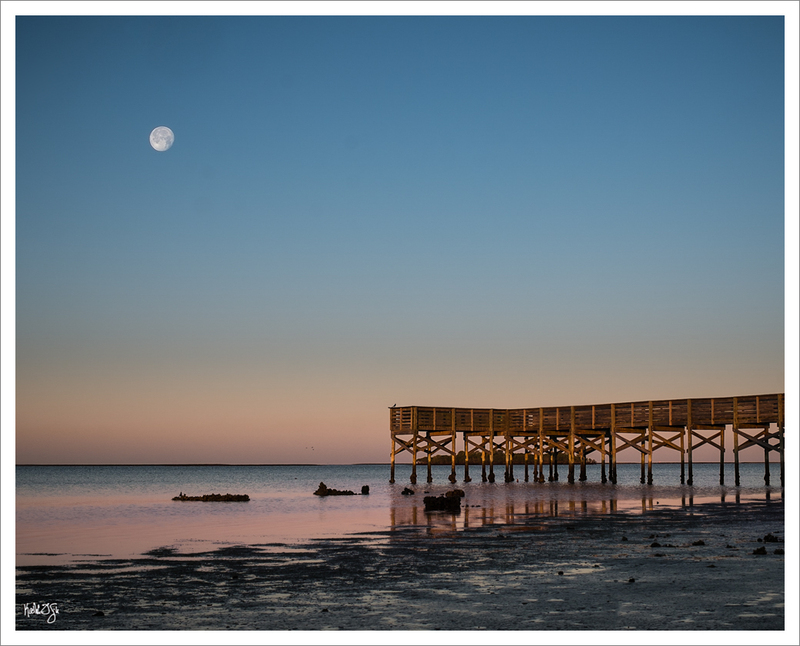 Last week, I was drawn to our local fishing pier by the knowledge that the moon would be setting toward the pier, shortly after sunrise and at low tide. So there I was, in the half-dark on a finger-numbing February morning, no sound save the soft Gulf breeze, gingerly stepping through the wet marsh to find a pleasing composition. For just a moment, I was visited with child-like simplicity and wondered. Is the tide following the moon over the western horizon or is it the other way around, the moon being dragged by the receding tide? Or are they locked in a celestial dance with neither leading, both just drifting away to the west?